Project Focus: Is Brisbane Now Australia's Best International Airport? An airport is the first experience most tourists have of any destination and when it comes to luring even more visitors, and their all important money, first impressions count. 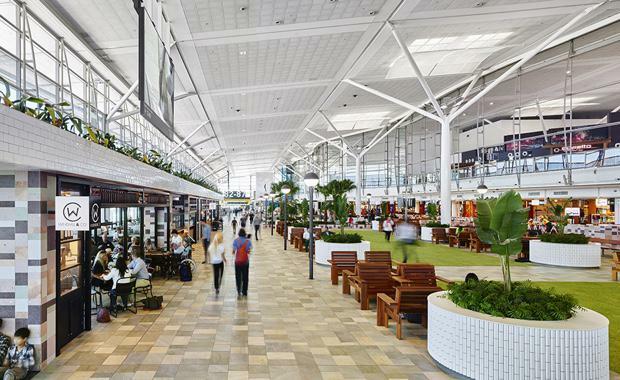 Brisbane Airport Corporation's (BAC) $45 million International Terminal redevelopment was designed to not only better its domestic rivals but to be 'world-best' and the preferred choice for passengers, airlines, business and the community. While the upgrade was officially opened in October last year it continues to draw plaudits from the industry, as well as visitors. With the goal of breaking the usual ‘airport mould’ and creating a distinct space that differentiated Brisbane Airport from all others, the redevelopment has already been recognised with the Queensland Property Council Award for Excellence in Design. Elements of the redevelopment included; a new themed Departures lounge, incorporating a sense of place that is uniquely Brisbane; new walk through Duty Free stores for both Departures and Arrivals; new specialty retail and food and beverage outlets offering the best of local produce and products; improved way finding for passengers and unrivalled views of aviation activity on the tarmac. Every part of the project was carefully designed to leverage the unique character of Brisbane, with a specific focus on Queensland’s enviable outdoor lifestyle and creating an environment that encapsulated the personality of Brisbane and Queensland. Julieanne Alroe, Brisbane Airport Corporation (BAC) CEO and Managing Director said the project was a significant milestone in the terminal’s 20 year history with the refurbishment putting Brisbane International on the map as one of the most beautiful in the world, while establishing a global benchmark for design. “This project has been a labour of love for everyone who has worked on it over the last few years, helping to create a truly unique gateway to Queensland," she said. “Everything we set out to achieve was accomplished to the highest quality, all while working within a secure terminal which continued to operate 24/7. "“This project was completed on time and on budget without any major disruptions to passengers or operations due to a focused and collaborative approach by all. Queensland artists were selected to provide key pieces within the redevelopment and local materials were used for a variety of aspects to support Queensland and Australian suppliers. The stunning fit-out features locally sourced stone, timbers, fittings and plants which define dedicated dwell, work and relaxation areas. Richards & Spence, as conceptual architects. The firm's worked together with the goal of establishing a unique sense of Brisbane with all elements of the development, while pursuing the vision of a world-class environment for travellers. The redevelopment was rolled out over 18 months with 38 stages, working on multiple zones and different floors. 24 new retail tenancies were progressively opened during the works with more than 4,600m2 of additional retail space created. 7500m2 of new tiles were laid – equivalent to 1.5 football fields• All building materials (tiles, steel, concrete, sand etc.) were individually scanned at security before being taken into the secure zone. The biggest challenge was working in a ‘live’ 24/7 airport environment with approximately 7.5 million passengers coming through the terminal during the redevelopment. Works took place during the quiet times of the day, with major construction scheduled late at night and in the early morning so that disruption to travellers was minimal. There was no impact to the usual passenger check-in, screening and security processes. The team made a huge effort to ensure the terminal did not look like a construction site and, where possible, continued to look and feel like a fully operational terminal. It’s estimated that 750 people actively worked on the project over the 5 year period, including 100 BAC staff.